Almost everywhere you turn, it seems, people have their eyes glued to smartphone screens playing Pokémon Go. Since its launch last week, the app has quickly become a cultural phenomenon that has fans of all ages hunting around their neighborhoods for collectible digital creatures that appear on players' screens as they explore real-world locations. But there's at least one place that would really like to keep Pokémon out: the Holocaust Museum. The museum, along with many other landmarks, is a "PokéStop" within the game — a place where players can get free in-game items. There are three PokéStops associated with various parts of the museum. "Playing the game is not appropriate in the museum, which is a memorial to the victims of Nazism," Andrew Hollinger, the museum's communications director, told The Post. "We are trying to find out if we can get the museum excluded from the game." The Holocaust Museum's plight highlights how apps that layer a digital world on top of the real one can create awkward situations, especially since the owners of the physical locations often cannot weigh in on how their spaces are being used. 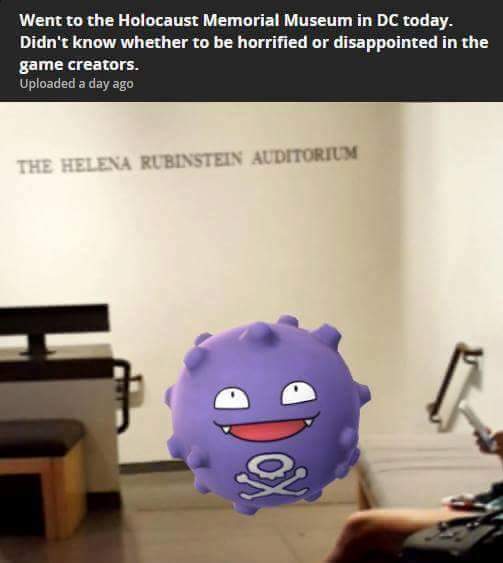 One image circulating online appears to show a player encountering an unsettling digital critter inside the museum: a Pokémon called Koffing that emits poisonous gas floating by a sign for the museum's Helena Rubinstein Auditorium. The auditorium shows the testimonials of Jews who survived the gas chambers. The image, which appears to have originated from a now deleted post on the photo-sharing site imgur, might be a hoax: That particular Pokémon didn't appear nearby when this Post reporter visited the museum Monday afternoon, although the specific Pokémon that appears in each location does vary from time to time. Hollinger said that the museum is concerned about the potential Koffing appearance. Niantic did not immediately respond to inquiries about the alleged Koffing sighting or if there was any way to honor the Holocaust Museum's request to stop Pokémon from popping up inside its building. Hollinger stressed that the museum is generally pro-technology and encourages visitors to use social media to share how their experiences with the exhibits moved them. "But this game falls very much outside that," he said. On Monday afternoon, there were plenty of people inside the museum who seemed to be distracted from its haunting exhibits as they tried to "catch 'em all," as the Pokémon slogan goes. A player even used a lure module, a beacon that attracts Pokémon to a specific PokéStop, on the museum's marker — making double-headed bird-like creatures dubbed Doduos and rodent-like Rattatas practically swarm on users' screens. The player behind the lure, a 30-year-old visiting from North Carolina named Dustin who declined to share his last name with The Post for privacy reasons, was excited to catch a crustacean-like Krabby while waiting in the museum's lobby with a group of friends to pick up tickets for a scheduled tour. Although the museum is uncomfortable with its Pokémon infestation, most of the players building up their digital critter collection inside the building at least didn't seem to mean any disrespect. "It's not like we came here to play," said Angie, a 37-year-old member of Dustin's group who also declined to share her last name for privacy reasons, "But gotta catch 'em all."